Airbus has successfully completed the maiden flight of the A319neo, D-AVWA (c/n 6464). Powered by CFM International LEAP-1A engines, the smallest member of the A320neo Family, took off from Hamburg/Finkenwerder on March 31, landing at the manufacturer’s Toulouse facility after a five hour test flight. Experimental test pilots Michel Gagneux and Eckard Hausser had the honour of conducting the first flight and were assisted by Test-Flight Engineer Jean Michel Pin and flight test engineers Sylvie Loisel-Labaste and David O’nions. The A319neo, which can accommodate up to 160 passengers, will be based in Toulouse where the flight test programme will be completed. Airbus says the flight campaign will focus primarily on aircraft handling qualities, autopilot and performance and systems, building on the required engine tests that already have been performed with the A320neo and A321neo. 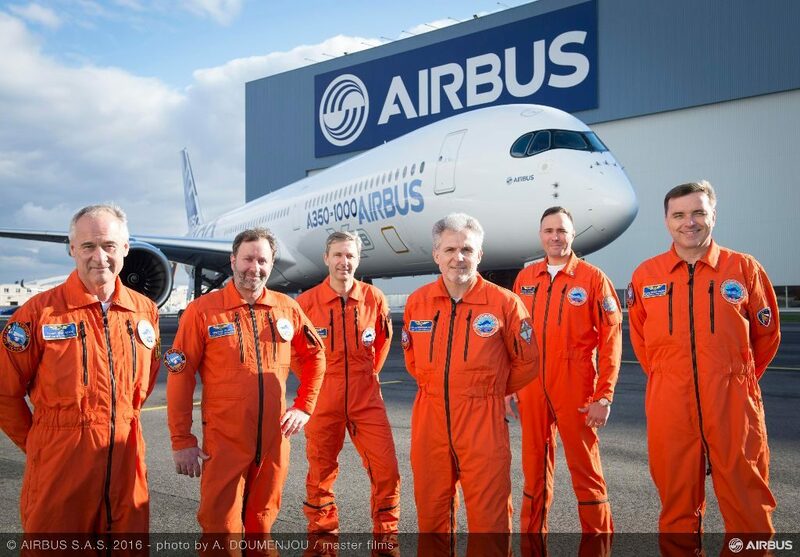 European aerospace giant Airbus is celebrating the second of two major landmarks in as many months after the A350-1000 successfully completed its maiden flight. 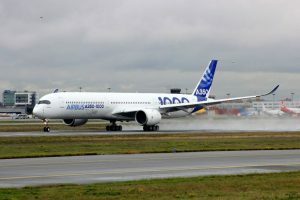 Thunderstorms and torrential rain did little to dampen the occasion, which came just weeks after the company delivered its 10,000th aircraft. 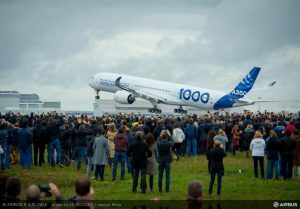 Notably, most first flights are approached by the manufacturer with a degree of trepidation, but Airbus gathered hundreds of journalist, suppliers, customers and employees at its Toulouse/Blagnac facility to witness the flight, reflecting a high degree of confidence in its newest widebody jet. Departure was originally planned for around 10.30am and, after keeping the waiting crowd in suspense, the prototype A350-1000, F-WMIL (c/n 057), lifted off from a saturated Runway 32L shortly before 11am on November 24. The take-off marked the start of a 1,600-hour, three-aircraft flight test campaign that is due for completion inside 12 months. 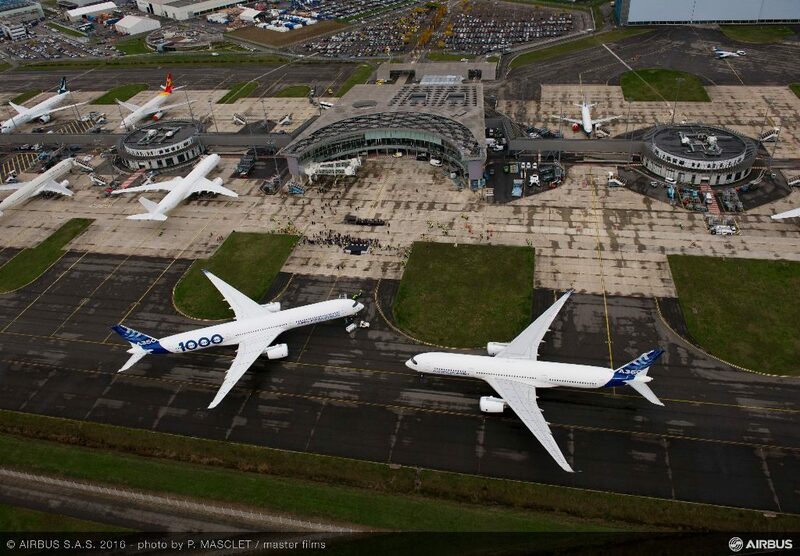 With a fuselage length of 242ft 5in (73.78m), the A350-1000 is the longest twin-jet ever produced by Airbus. It shares a high degree of commonality with its -900 stablemate, though the latest variant of the family is around 23ft (7m) longer and can accommodate an additional 41 seats, up from 325 to 366. It also features more powerful Rolls-Royce Trent XWB engines, each offering 97,000lb of thrust over the previous 84,000lb, along with improved aerodynamics and six-wheel main bogies to reduce pavement loading. 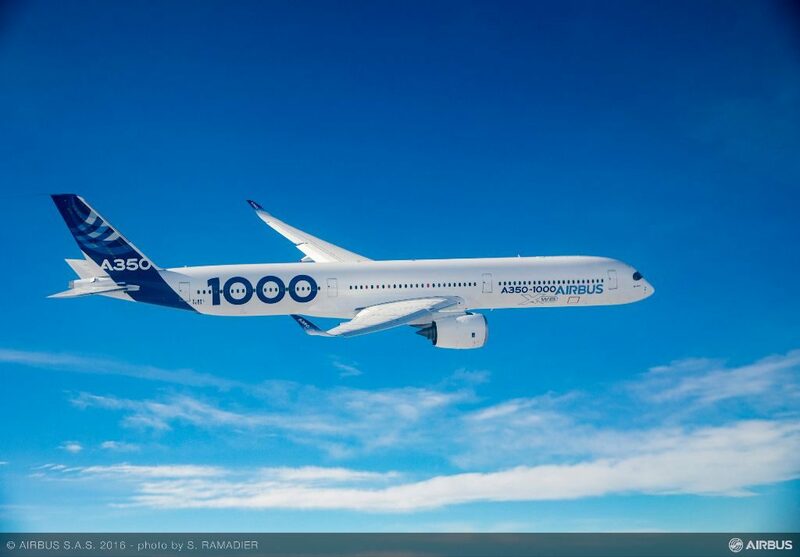 François Caudron, Airbus’ Senior Vice President Marketing said the newest member of the A350 Family had been developed specifically to meet the requirements of potential operators. This was achieved, Caudron noted, through the use of a clean-sheet deign. The A350-1000 is around 40 tonnes lighter than its competitor at maximum take-off weight, “but because it is more efficient, it is able to fly 450nm (833km) further”. He was also bullish about the XWB’s prospects against the next-generation 777X. Chris Young, Rolls-Royce’s (RR) President – Small and Medium Engines extolled the virtues of the Trent XWB, the sole powerplant for the A350 Family. Development of the Trent XWB family has been continuous. The 97,000lb variant was launched in 2011 and ran for the first time in 2014. Since then, RR has embarked on what Young dubbed a “truly global test programme”. He added: “We have to prove the basic capability of the engine, the maturity of the engine and show that it’s safe and able of flying.” This included cold weather and crosswind testing in Manitoba and Mississippi respectively, as well as at RR’s own facility in Derby. The manufacturer also co-operated with Airbus on an extensive flight campaign, completing almost 180 hours on the A380 flying testbed. After departing from Blagnac in the company of chase plane Dassault Falcon 20, F-GPAA (c/n 103), the prototype A350-1000 routed south towards the Pyrenees and one of the manufacturer’s test areas. The first element of the sortie was flown with the fly-by-wire system in the most basic ‘direct law’, where pilot inputs are transmitted directly to the flight controls with no protection. Utilising a block of airspace between FL100 and FL150, the crew initially worked for around 2hrs 30mins to explore the -1000’s handling and flight envelope, flying at minimum and maximum speed with flaps at configuration 3 and the landing gear extended. After successfully testing the pressurisation and flight control systems, the aircraft was cleaned up. The gear was retracted for the first time, and fly-by-wire was switched to ‘normal law’, the regular operating configuration, before the crew climbed up to FL250 for further testing including acceleration up to the maximum Mach number. The final phase of the sortie consisted of a descent back to medium altitude for low-speed handling and landing configuration checks, then returning to Toulouse. The assembled crowd was treated to a low-level flypast before the jet arrived back at Blagnac after 4hrs 18mins in the air. 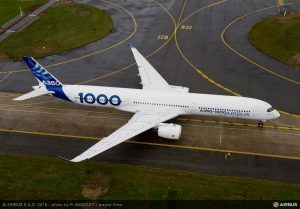 Airbus had already undertaken a significant volume of work on the -1000 even before the aircraft took flight. This included lab testing of the landing gear, electrics and flight controls, systems integration and crew training on the ‘Aircraft Zero’ simulator, and engine testing on a dedicated A380 flying test-bed. Once the first prototype was rolled out, the manufacturer then performed aircraft and flight test installation, ground engine runs and finally low- and high-speed rejected take-offs, carried out at 100kts and 140kts respectively. The jet was then thoroughly inspected before being handed over to the flight crew for its maiden sortie. The three prototypes used for the certification process (see table) are expected to amass around 1,600 flying hours over the coming months. This includes cold and hot weather and high altitude campaigns to be flown by MSN 071, while MSN 065 will be used for cabin development, route proving and ETOPS and will feature a fully furnished cabin. The first example, MSN 059, is equipped with a comprehensive testing suite featuring up to 15 cameras and 3,000 sensors, connected by 74.5 miles (120km) of wires. It is capable of recording more than 600,000 parameters and 3,300 measurements using 220 different types of sensor. Airbus has also installed a variety of time-saving measures in its test fleet, including transferable ballast that allows engineers on board the aircraft to move its centre of gravity by up to 10% in flight. This was previously only possible on the ground and required multiple sorties. The test station installed in the cabin has direct access to the A350’s flight computers, allowing for instant adjustments of the control systems. Data is also fed real-time to five different telemetry rooms – two in Toulouse and others in Filton, Hamburg and Bremen, enabling ground-based specialists to monitor the progress of the sortie. The manufacturer has wasted little time since the maiden flight. The first prototype was airborne again on November 29 as the test campaign gathers pace. Certification, and delivery to launch customer Qatar Airways, is expected during the latter half of 2017. 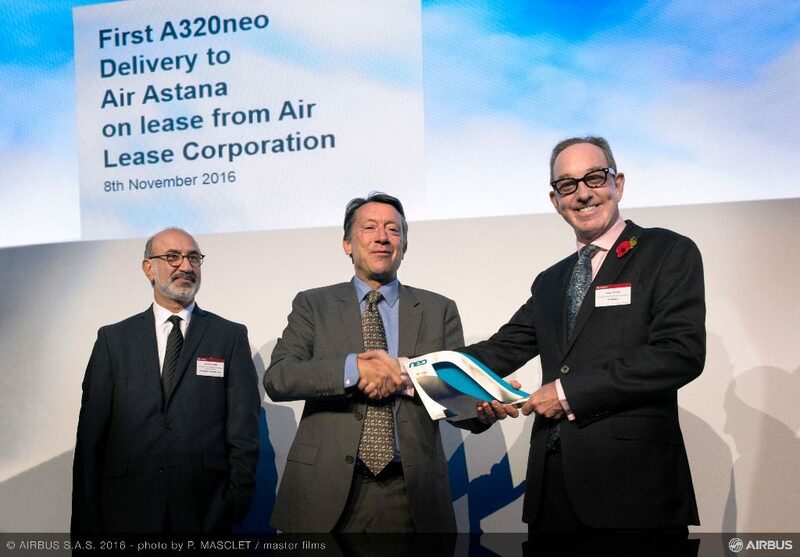 Kazakh flag carrier Air Astana has taken delivery of its first Airbus A320neo at a special ceremony at the manufacturer’s Toulouse facility. The jet, registered P4-KBH (c/n 7124) and leased from Air Lease Corporation, is the first of 11 A320neo Family aircraft the airline ordered at the Farnborough Airshow in 2015. It is configured in a two-class layout, with 16 Business Class seats and 132 in Economy. Air Astana already operates a fleet of 13 A320ceo Family aircraft, with the neo joining them on the carrier’s domestic and international network. Final assembly of the first Airbus A330neo has begun at the manufacturer’s facility in Toulouse, France. The wings of the jet, an A330-900, have been mated to the centre fuselage at the station 40 position of the assembly line. Both the A330-800 and -900 will have a new A350-inspired wing with Sharklets coupled with Rolls-Royce Trent 7000 engines which Airbus claims will reduce fuel consumption by 14% per seat. The neo also offers an additional 400nm range over the existing ceo, giving the A330-900 a 6,550nm range and the A330-800 7,500nm. 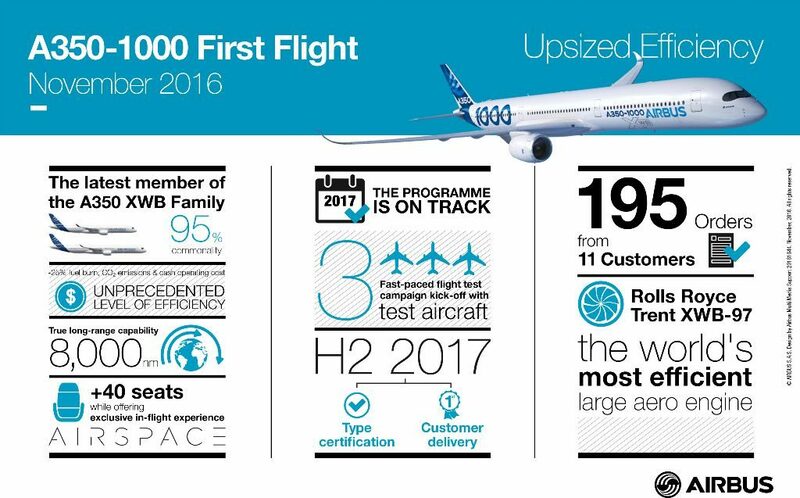 The manufacturer added the -800 and -900 will share a 99% commonality, while the entire A330 family is 95% common. Ten customers have ordered the new variants, totalling 186 firm commitments. 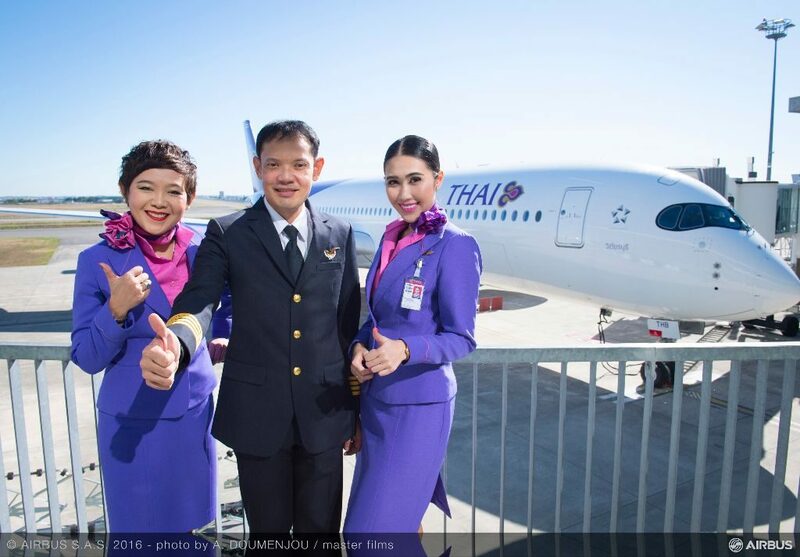 Thai Airways International has taken delivery of its first Airbus A350-900, making it the eighth operator of the type. The jet, which is leased from CIT, is registered HS-THB (c/n 044) and has been named Wichian Buri. It is the first of 12 the carrier has on order, four of which are being purchased directly from Airbus. Thai’s A350s are configured in a two-class layout, consisting of 32 Royal Silk Class, convertible fully lie-flat beds and 289 seats in Economy Class. In Royal Silk Class, seat pitch is between 41 and 46in with each having a 16in touchscreen. In Economy Class, the seats are pitched at 32in and are equipped with an 11in touchscreen. Wi-Fi is also provided on board. The jet will debut on domestic services between Bangkok and Chiang Mai before making its long-haul bow on the Bangkok-Melbourne route. Airbus has handed over LATAM Airlines Group’s first A320neo. The carrier is the first in the Americas to operate the latest generation jet, which is powered by Pratt & Whitney Pure Power PW1100-JM engines. Executives from LATAM and Airbus attended a delivery ceremony at the manufacturer’s Toulouse, France, facility where the carrier also took delivery of its fourth A350 XWB. Both jets are painted in LATAM’s new livery. The South American carrier will debut the 174-seat neo on domestic services before expanding to regional routes in November. The airline has 67 A320neo Family aircraft on order.